FORMost is a market leader in providing government compliant forms – Tax Forms and Health Insurance Claim Forms for your end of year reporting requirements. For over 35 years our clients have relied on us for IRS approved forms as well as the most up-to-date information regarding the filing requirements, content and pend-ing changes. Whether you are looking for W-2s, 1099s or the new ACA reporting forms, we’ve got you covered. We offer the most complete selection of tax forms, pressure-seal forms and envelopes available. And we keep the complete line of forms (and envelopes!) in stock for the entire season! We have shipping locations across the country to deliver these critical forms to you fast and efficiently. E-ﬁle- Quick and Easy Online Filing of W-2, 1099, and ACA Forms Starts Here! 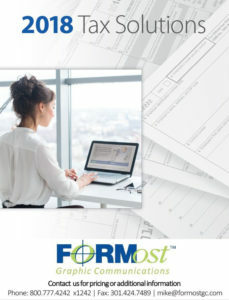 FORMost has the exact tax form for all your tax form requirements. We carry a complete range of Laser Cut Sheet and Pressure Seal Tax Forms, Business Tax Form Envelopes, W-2 and 1099 Continuous Business Tax Forms and Mailers, ACA, Miscellaneous Tax Forms and other information. View the 2018 Tax forms catalog or go online to order today. Since 1985, we have been helping businesses to stand out from their competitors with distinguished and effective graphic solutions. To learn more about print and promotional products, or to see how we can satisfy your marketing service and print needs, contact us to-day.